This chainmail shirt is crafted in Code 9 riveted aluminum mail, featuring 10mm, dome-riveted rings with gray anodizing. 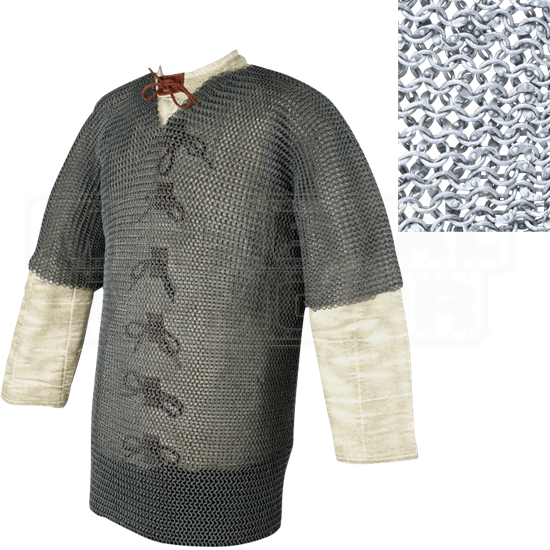 This chainmail shirt is ideal for the non-contact role-player, this piece will present an authentic appearance. A matching coif (AB3928) is available. This style of chainmail is reasonably authentic to the early medieval period, particularly in the European Riveted version. More economical than wedge-riveted maille, the domed-head riveted style is available in steel, in round wire and flat ring versions, and in round wire aluminum. Construction is in the 4 in 1 pattern.